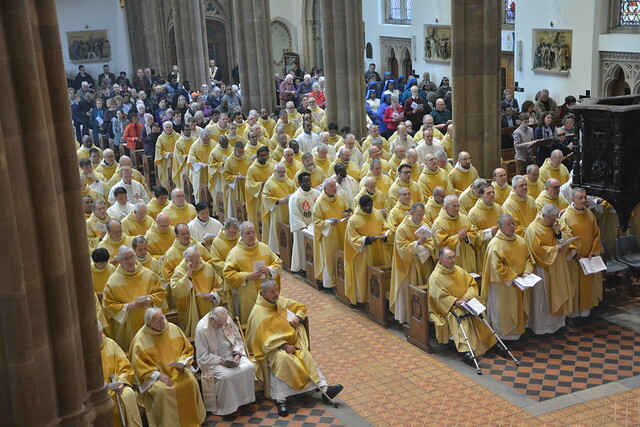 Hundreds gathered for the annual Chrism Mass at St Chad’s Cathedral today (Wed). Archbishop Bernard Longley was joined by the Bishops, and many of the priests and deacons of the Archdiocese, at the Holy Week service. His Grace opened the Mass with special prayers to the clergy and people of Notre Dame, following the devastating fire earlier this week. He hoped the rebuilding of the Cathedral would act as an ‘instrument of evangelisation’. At the Chrism Mass the Archbishop blessed the holy oils - the Oil of Catechumens, the Oil of the Sick and consecrated the Oil of Holy Chrism. These will be used in the administration of the sacraments throughout the parishes of the Archdiocese in the course of the year. Archbishop Longley also led the priests in renewing their promises to serve God and his people. This Mass symbolises the unity of the Presbyterate as the Bishops, priests and deacons gather around the Archbishop. During his Homily Archbishop Bernard gave thanks to the jubilarians, and all those celebrating special anniversaries of their priestly ordination this year. Including: Diamond Jubilarians Bishop Philip Pargeter and Mgr John Heslin; Golden Jubilarians Frs Sandy Brown, Paul Chamberlain, John Darley, Christopher Handforth, Tony Joyce and Joseph Narikuhzi and Silver Jubilarians Frs Laurence Crowe and Anthony Pham-Tri-Van. In July, Deacons Marco Egawhary, Ryan Service and John Waters will, please God, be anointed with the chrism consecrated today and ordained priests in the Cathedral. It was standing room only at the service, which was accompanied throughout by the St Chad’s Cathedral Choir.